The Sri Lanka Economic Forum is to be held under auspices of the Sri Lankan Prime Minister on 7 January 2015. Chief Guests at this event are George Soros and Prof. Joseph Stiglitz. The theme of the event is “steering Sri Lanka towards sustainable and inclusive development-PM Ranil Wickremasinghe’s agenda for development’. Do the people of Sri Lanka know who George Soros actually is? George Soros & Open Society Foundation: Soros runs a global empire of NGOs promoting “human rights” “freedom” “democracy” & “transparency” to cover institutional crimes in collaboration with neo-conservatives of the US State Department-funded National Endowment for Democracy & subsidiaries. 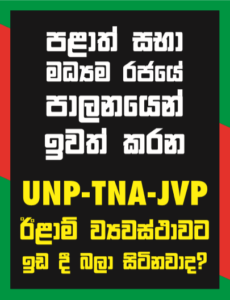 තම හෙංචයියලාගෙන් සමන්විත කමිටුවක් පත්කරන්නේ ව්‍යවස්ථාවේ කිනම් වගන්තියක් යටතේ ද?